It’s been almost 30 years since we lost the brilliant musical talent, Irving Berlin, but his music lives on. In fact, the great news is that we can frequently hear some of his most famous songs throughout the year at sporting events, at Christmastime and in musical revivals across the country. 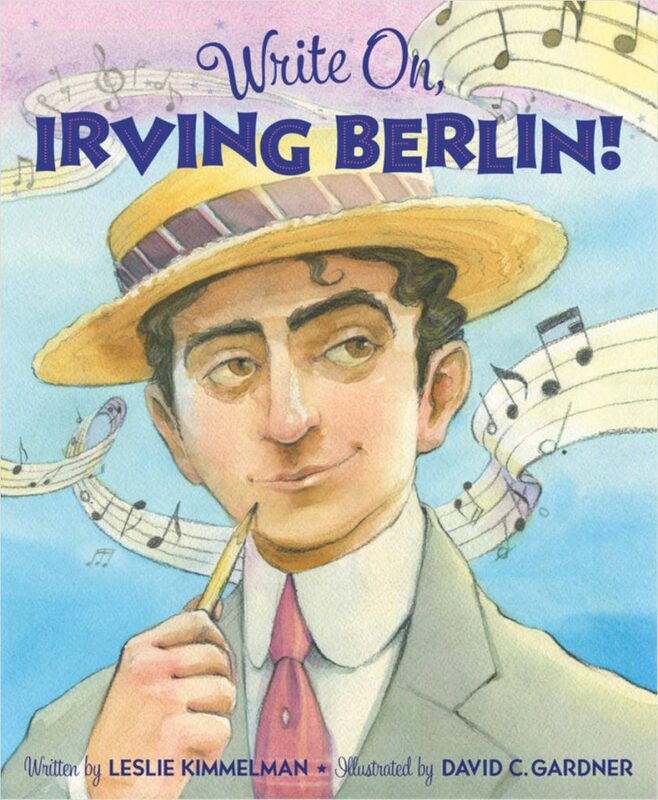 Write On, Irving Berlin! 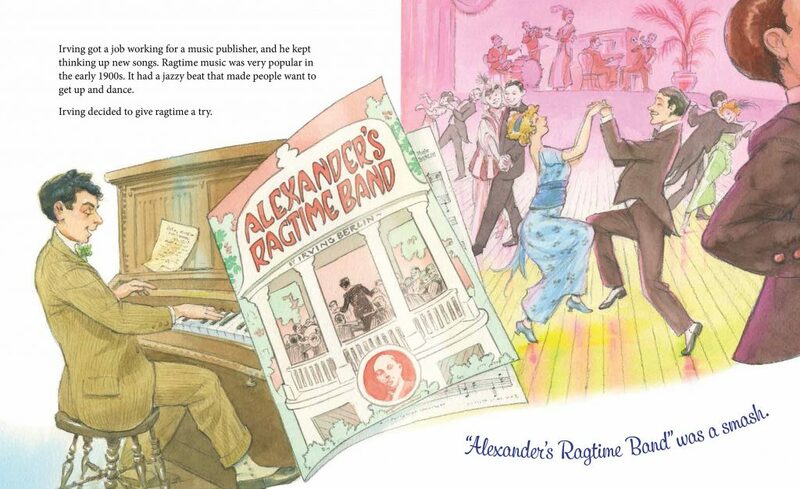 written by Leslie Kimmelman and illustrated by David C. Gardner is billed as a lyrical story of an immigrant and the composition of “God Bless America.” This picture book biography provided the interesting back story of the man behind so many hits including “Alexander’s Ragtime Band”, “Putting On The Ritz”, “White Christmas”, “Oh! How I Hate to Get Up in the Morning” as well as all the wonderful songs from Annie Get Your Gun, Easter Parade and many others. 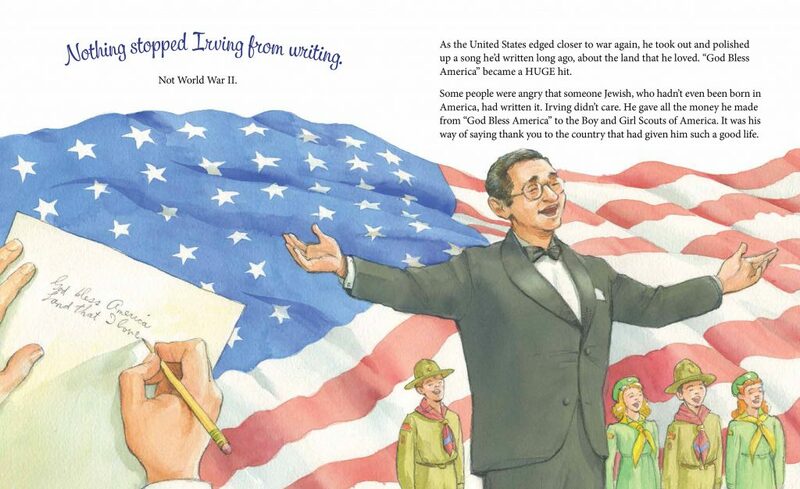 Interior spread from Write On, Irving Berlin! written by Leslie Kimmelman with illustrations by David C. Gardner, Sleeping Bear Press ©2018. Soon Irving Berlin married but not long after the wedding, his wife Dorothy became ill and died. He turned to his music to get him through his grief, still grateful for all that his new country had given him. During WWI Berlin was drafted into the army where he wrote songs to lift the spirits of his fellow soldiers. After that he found love again with Ellin and wrote the song “Always” for her. One hit followed another and Berlin’s popularity grew. 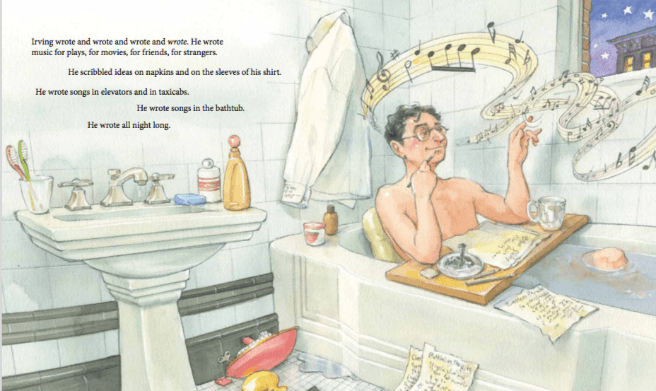 He seemed to live and breathe music and wrote songs at any time of the day or night and in any place, including the bathtub! It probably took little time to write one of his all time greats, “God Bless America”, a song that celebrates its 100th or 80th anniversary this year depending on whether you count when he first composed it or when he released it decades later. I had no idea Berlin donated all the proceeds from the song to the Boy and Girl Scouts of America or that people weren’t happy that a Jewish man, an immigrant, had written the song. What stunned me was those same folks could again not embrace his other huge hit, “White Christmas” for the same reason. Despite that, Berlin is said to have told a friend he thought it was the best song anybody had ever written. There is more to learn about this amazingly talented man such as how he traveled to war zones during WWII to help entertain the troops and how his fount of song ideas seemed ever flowing. Kimmelman’s included an author’s note in the back matter where I learned Berlin not only helped found the American Society of Composers, Authors and Publishers (ASCAP) but in his lifetime he received not only the Medal of Merit from President Truman but the Congressional Medal of Honor from President Eisenhower as well. Kimmelman’s shared just the right amount of information with her prose although there is so much material about Berlin to choose from given his long career. I liked how, since this is an anniversary year for “God Bless America”, she included that very line at various points throughout the book. Looking at Gardner’s beautiful historical imagery with its water color quality, readers will get a terrific sense of time, place and mood. Prepare to be transported back by both Kimmelman’s words and Gardner’s illustrations to a time when Tin Pan Alley was turning out the hits and Irving Berlin was at the top of his game. 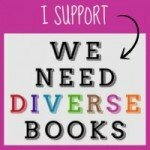 I recommend reading the book while playing a selection of some of his songs which can be found here. Don’t miss the biography of the man and his music in Muddy: The Story of Blues Legend Muddy Waters. The story of blues legend Muddy Waters is told in prose which reads like one of his songs, filled with both sweetness and longing. Author Michael Mahin does a fine job of recreating for a young reader the life of Muddy Waters from his childhood days to one of the high points of his career, the creation of his first album. 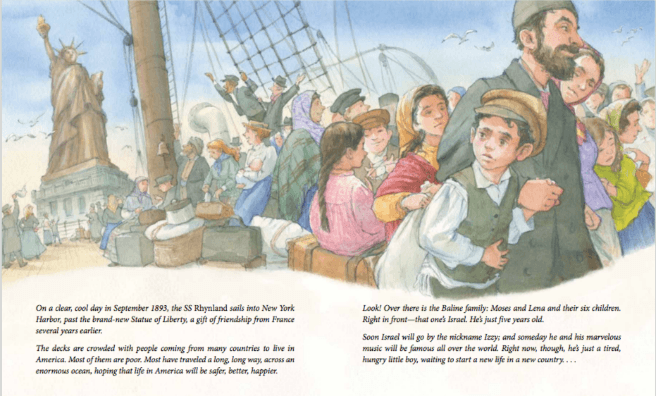 All along the way through the book, beside those sweet and longing words of the author, are Evan Turk’s amazing illustrations that take your breath away. They look like the blues! They look like Muddy Water’s story and some of his soul. Strong lines paint the bold story of the legend, and color reaches out to convey the emotion that Muddy was going through at different times in his life. Truly these are some of the most unique illustrations to appear in a picture book. The people in Muddy’s life reach high in church, bow low over a harmonica, every movement is full of energy. Muddy’s grandmother appears as a larger than life character. She takes up so much room in one memorable two-page spread that one cannot escape the dominant presence she must have had in Muddy’s life. 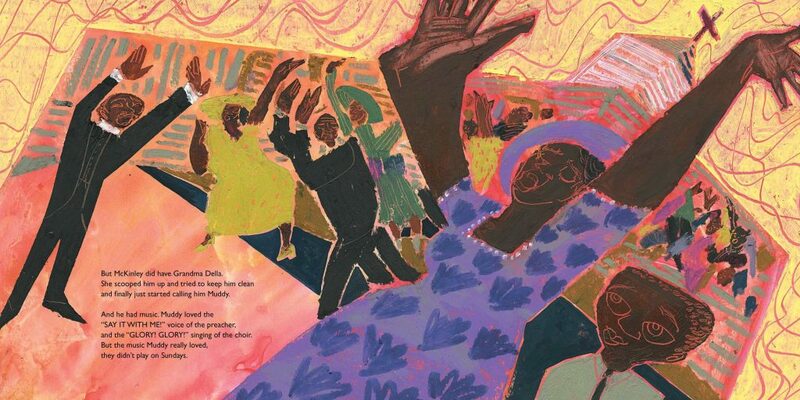 There is some kind of motion everywhere, in the playing of music, in the form of Muddy’s grandmother as she hangs her laundry while dancing to Muddy’s music, and in the movement of Muddy himself as he plays and sings. Interior spread from Muddy: The Story of Blues Legend Muddy Waters by Michael Mahin with illustrations by Evan Turk, Atheneum BYR ©2017. so good at pulling people apart. 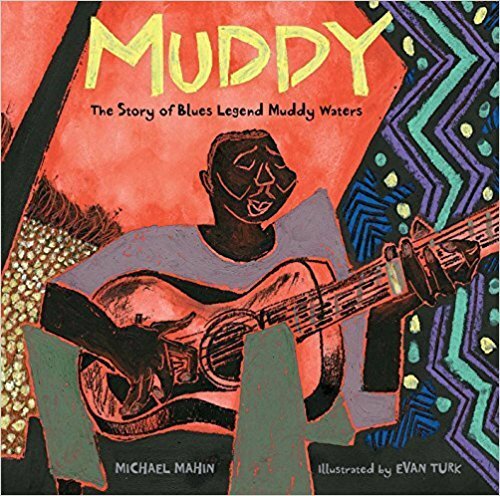 Muddy: The Story of Blues Legend Muddy Waters is an incredibly powerful picture book in every respect and is highly recommended. At the bookstore where I work, this is a staff favorite because we all agree that it is one of the most extraordinary picture books we have seen this year. Muddy is a wonderful introduction to the life of a legend as well as an inspirational and evocative experience of art so well matched to the man and his blues that you can almost hear the music playing. This hardcover picture book will be available September 5, 2017 but can be pre-ordered now.